The way we access healthcare in the United States is changing rapidly. For seniors, their families, and medical providers, these changes can be challenging to understand. 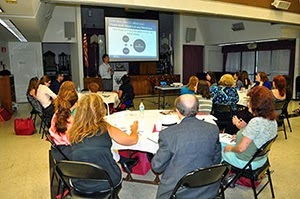 On Wednesday, June 18th, the Los Angeles Jewish Home hosted a training session to help geriatric social workers and nursing home administrators gain insight into California's Coordinated Care Initiative, or CCI. The initiative is being implemented across the state to integrate medical, behavioral and long-term care services for individuals who receive both Medicare and Medi-Cal, known as dual eligibles, and those with Medi-Cal only. The training session was opened by the Jewish Home's CEO-President Molly Forrest, who welcomed the attendees and spoke briefly about the Home and the impact of healthcare reform on seniors. Denny Chan, staff attorney for the National Senior Citizens Law Center, provided an overview of CCI. He reviewed the major changes brought about by the initiative, with the major difference being the integration of Medicare and Medi-Cal benefits into one managed care plan. "Most dual eligibles will have the option to join Cal MediConnect, which currently is offered through five managed care plans in Los Angeles County," he explained. Do nothing, which means the individual will be passively enrolled into a Cal MediConnect plan as chosen by the State. PACE, one of the alternatives to Cal MediConnect, is currently available at the Jewish Home's Grancell Village Campus. The Brandman Centers for Senior Care (BCSC) is a Program of All-inclusive Care for the Elderly, or PACE. The program offers adult day healthcare, including medical care, activities, physical therapy, meals, transportation and other personal services to seniors who are eligible for admission to a nursing home but have elected to remain safely in their own homes. Mari Abrams, director of marketing for BCSC, spoke about PACE and the benefits of participation. The training session came to an end with a lively question and answer session. What could be a difficult and dry subject was made understandable and even enjoyable by the speakers and their presentations. For more information about the Brandman Centers for Senior Care, please visit their website at www.brandmanseniorcare.org.